Magnetic seam guide attaches to metal throat plate on sewing machine. Ideal for ensuring uniform seam width and as a guide to straight stitching. Anti-skid design prevents magnet from sliding around. Lightweight rust-free plastic construction compare to traditional metal body. 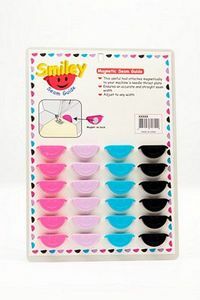 Smiley face cheerful design in Aqua Blue Jet Black Hot Pink Orchid Purple. Not recommended for computerized sewing machines.